An earthquake is a phenomenon that results from and is powered by the sudden release of stored energy in the crust that propagates seismic waves. At the Earth's surface, earthquakes may manifest themselves by a shaking or displacement of the ground and sometimes tsunamis, which may lead to loss of life and destruction of property. Earthquakes may occur naturally or as a result of human activities. In its most generic sense, the word earthquake is used to describe any seismic event—whether a natural phenomenon or an event caused by humans—that generates seismic waves. Most naturally occurring earthquakes are related to the tectonic nature of the Earth. Such earthquakes are called tectonic earthquakes. The Earth's lithosphere is a patchwork of plates in slow but constant motion caused by the heat in the Earth's mantle and core. Plate boundaries grind past each other, creating frictional stress. When the frictional stress exceeds a critical value, called local strength, a sudden failure occurs. The boundary of tectonic plates along which failure occurs is called the fault plane. When the failure at the fault plane results in a violent displacement of the Earth's crust, the elastic strain energy is released and seismic waves are radiated, thus causing an earthquake. This processes of strain, stress, and failure is referred to as the Elastic-rebound theory. It is estimated that only 10 percent or less of an earthquake's total energy is radiated as seismic energy. Most of the earthquake's energy is used to power the earthquake fracture growth and is converted into heat. Therefore, earthquakes lower the Earth's available potential energy, though these losses are negligible. 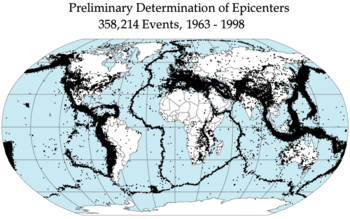 The majority of tectonic earthquakes originate at depths not exceeding a few tens of kilometers. In subduction zones, where older and colder oceanic crust descends beneath another tectonic plate, earthquakes may occur at much greater depths (up to hundreds of kilometers). These seismically active areas of subduction are known as Wadati-Benioff zones. Deep focus earthquakes are another phenomenon associated with a subducting slab. These are earthquakes that occur at a depth at which the subducted lithosphere should no longer be brittle, due to the high temperature and pressure. A possible mechanism for the generation of deep focus earthquakes is faulting caused by olivine undergoing a phase transition into a spinel structure. Earthquakes may also occur in volcanic regions and are caused by the movement of magma in volcanoes. Such quakes can be an early warning of volcanic eruptions. A recently proposed theory suggests that some earthquakes may occur in a sort of earthquake storm, where one earthquake will trigger a series of earthquakes each triggered by the previous shifts on the fault lines, similar to aftershocks, but occurring years later, and with some of the later earthquakes as damaging as the early ones. Such a pattern was observed in the sequence of about a dozen earthquakes that struck the North Anatolian Fault in Turkey in the 20th Century, the half dozen large earthquakes in New Madrid in 1811-1812, and has been inferred for older anomalous clusters of large earthquakes in the Middle East and in the Mojave Desert. Some earthquakes have anthropogenic sources, such as extraction of minerals and fossil fuel from the Earth's crust, the removal or injection of fluids into the crust, reservoir-induced seismicity, massive explosions, and collapse of large buildings. Seismic events caused by human activity are referred to by the term induced seismicity. They however are not strictly earthquakes and usually show a different seismogram than earthquakes that occur naturally. A rare few earthquakes have been associated with the build-up of large masses of water behind dams, such as the Kariba Dam in Zambia, Africa, and with the injection or extraction of fluids into the Earth's crust (e.g. at certain geothermal power plants and at the Rocky Mountain Arsenal). Such earthquakes occur because the strength of the Earth's crust can be modified by fluid pressure. Earthquakes have also been known to be caused by the removal of natural gas from subsurface deposits, for instance in the northern Netherlands. The world’s largest reservoir-induced earthquake occurred on December 10, 1967 in the Koyna region of western Maharashtra in India. It had a magnitude of 6.3 on the Richter scale. However, the U.S. geological survey reported the magnitude of 6.8. The detonation of powerful explosives, such as nuclear explosions, can cause low-magnitude ground shaking. Thus, the 50-megaton nuclear bomb code-named Ivan detonated by the Soviet Union in 1961 created a seismic event comparable to a magnitude 7 earthquake, producing the seismic shock so powerful that it was measurable even on its third passage around the Earth. In an effort to promote nuclear non-proliferation, the International Atomic Energy Agency uses the tools of seismology to detect illicit activities such as nuclear weapons tests. The nuclear nations routinely monitor each other's activities through networks of interconnected seismometers, which allow to precisely locate the source of an explosion. Sports games have been known to inadvertently produce microearthquakes. This phenomenon was first seen in 1988 with the Earthquake Game at Louisiana State University, in which fans stamped their feet and jumped up and down vigorously enough to have the effect register on the campus seismograph. Earthquakes happen every day around the world, but most of them go unnoticed and cause no damage. Large earthquakes however can cause serious destruction. They may be caused by the ground shaking, a tidal wave or tsunami, fire or by gas or petrol leaks. Most large earthquakes are accompanied by other, smaller ones that can occur either before or after the 'main shock'. The power of an earthquake covers a large area, but in a very large earthquake, it can even cover the whole planet. Scientists can locate the point from which the earthquake started. That point is called its 'focus' or 'hypocenter'. The location on the surface of the earth directly above the hypocenter is known as the 'epicenter'. Since seismologists cannot directly observe rupture in the Earth's interior, they rely on geodetic measurements and numerical experiments to analyze seismic waves and accurately assess severity of earthquakes. The severity of an earthquake can be measured in terms of magnitude and intensity. For that seismologists use two fundamentally different but equally important types of scales. The original force or energy of an earthquake is measured on a magnitude scale. The Richter scale is a well known example of a magnitude scale. The second type of scale measures the intensity of shaking occurring at any given point on the Earth's surface. These scales are referred to as intensity scales. The Mercalli intensity scale, which measures the effects of the seismic waves, is an example of a commonly used intensity scale. The non-specialized media will often refer to the magnitudes of earthquakes as being reported on the Richter scale. However, the magnitudes reported nowadays are actually on the moment magnitude scale. This is because the older Richter scale is not well-suited to accurately measure earthquakes with magnitudes over 6.8. The analyses of earthquake severity allow scientists to estimate the locations and likelihoods of future earthquakes, helping identify areas of greatest hazard and ensure safety of people and infrastructure located in such areas. 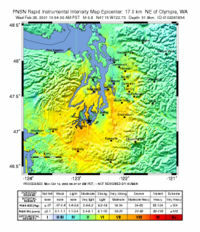 An isoseismal map created by the Pacific Northwest Seismograph Network showing the instrument-recorded intensities of the 2001 Nisqually earthquake of February 28, 2001. A Community Internet Intensity Map generated by the USGS showing the intensity of shaking felt by humans during the Nisqually earthquake; locality divisions are by ZIP Code. To show the extent of various levels of seismic effects within a particular locality, seismologists compile special maps called isoseismal maps. An isoseismal map uses contours to outline areas of equal value in terms of ground shaking intensity, ground surface liquefaction, shaking amplification, or other seismic effects. Typically, these maps are created by combining historical instrument-recorded data with responses to postal questionnaires that are sent to each post office near the earthquake and to a sparser sample of post offices with increasing distance from the earthquake. This way of preparing a seismic hazard map can take months to complete. In contrast to the old method, a newer method of information collection takes advantage of the Internet to generate initial hazard maps almost instantly. Data are received through a questionnaire on the Internet answered by people who actually experienced the earthquake, reducing the process of preparing and distributing a map for a particular earthquake from months to minutes. Seismic hazard maps have many applications. They are used by insurance companies to set insurance rates for properties located in earthquake-risky areas, by civil engineers to estimate the stability of hillsides, by organizations responsible for the safety of nuclear waste disposal facilities, and also by building codes developers as the basis of design requirements. In building codes, the shaking-hazard maps are converted into seismic zone maps, which are used for seismic analysis of structural components of buildings. The seismic zone maps depict seismic hazards as zones of different risk levels. Such zones are typically designated as Seismic Zone 0, Seismic Zone 1, Seismic Zone 2 and so on. The seismic zone maps usually show the severity of expected earthquake shaking for a particular level of probability, such as the levels of shaking that have a 1-in-10 chance of being exceeded in a 50-year period. Buildings and other structures must be designed with adequate strength to withstand the effects of probable seismic ground motions within the Seismic Zone where the building or structure is being constructed. The number of earthquake reporting stations increased from about 350 in 1931 to about 4,000 today. As a result, many more earthquakes are reported than in the past -- currently, about 35 per day worldwide. This does not necessarily mean that the number of earthquakes has increased, however. The USGS estimates that, since 1900, there have been an average of 18 major earthquakes (magnitude 7.0-7.9) and one great earthquake (magnitude 8.0 or greater) per year, and that this average has been relatively stable. In fact, in recent years, the number of major earthquakes per year has actually decreased. More detailed statistics on the size and frequency of earthquakes is available from the USGS. Most of the world's earthquakes (90%, and 81% of the largest) take place in the 40,000 km-long, horseshoe-shaped zone called the circum-Pacific seismic belt, also known as the Pacific Ring of Fire, which for the most part bounds the Pacific Plate.Massive earthquakes tend to occur along other plate boundaries, too, such as along the Himalaya Mountains.